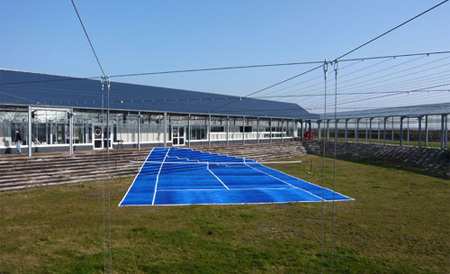 Creative art installations by Laurent Perbos place tennis courts in unusual locations and unique environments that normally are not associated with the game of tennis. 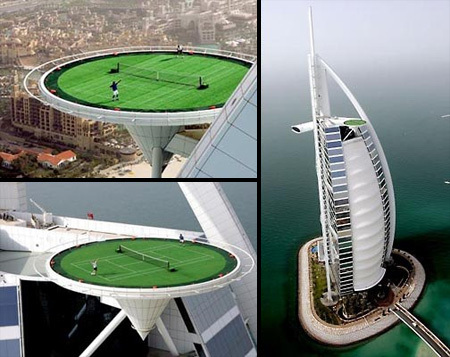 Another extreme location for a tennis court is the helipad of Burj Al Arab sailboat hotel in Dubai, 211 meters above the ground. Some are stupid (in water) and others are dangerous (amidst stairs). @Ambuj Saxena I do not believe the tennis court on the stairs it meant to be played on, but to show that enjoyment can be had anywhere. The Dubai tennis court is incredible! 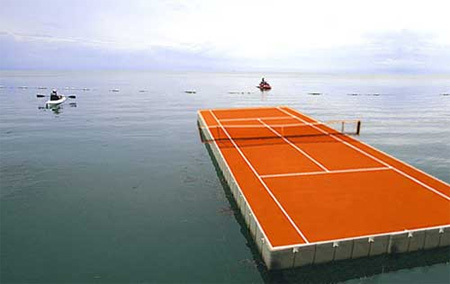 For dubai u need a lot of (tennis) balls and i see the court almost useless as they should have considered at least havin’ 10 meter more behind the back lines, othewise you play with the fear of falling on those metal grids. that one in the sea is awesome! so is the one on the hotel, but i would be scared of falling. i feel nauseous thinking about falling off the dubai court trying to return a power serve or something. Shot not getting the out balls for the Dubai court!! I’ve been on top of a handful skyscrapers… they are usually extremely WINDY!!! to up the “extreme” factor. The Dubai one was a publicity thing for Nike wasn’t it ? They also had ..I believe Tiger Woods up there playing golf. Obviously not practical, but I suppose fun installation art…although the shuttlecocks at the Nelson Adkins Museum in KC are lame. Makes the high acts that I did in the circus, even the ones with NO NET, look like child’s play. 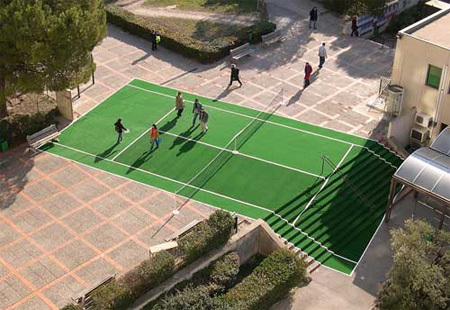 Now on the other hand, I might be able to play tennis with someone and actually hold my own, if they got the end with the STEPS!LOL! lol @ the one on the water. you’re screwed if you lose your ball. 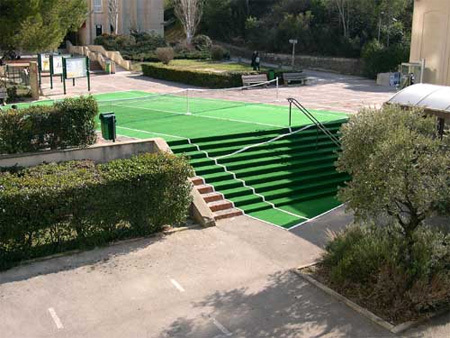 the one on stair is a wonderful idea as a kind of entrance for tennis court and its fans! iwas wondering what the wind speed would do to tennis match at the top of the tower in dubai! All three are awful ideas.